Front Rim 3.50 x 16"
Rear Rim 4.50 x 16"
Trail 117 mm / 4.6"
Wheelbase 1360 mm / 53.5"
This is a beast with a convoluted history. It’s one of just three racing RR1000s produced by Erik Buell before the road version was released in the late 80s. The story starts with the Harley Owners Group, which asked Buell to make a chassis for a race bike using the Harley-Davidson XR engine: the rise in engine capacity from 750 to 1000cc for AMA BoTT racing had made the XR750 uncompetitive against most European high-performance motorcycles. 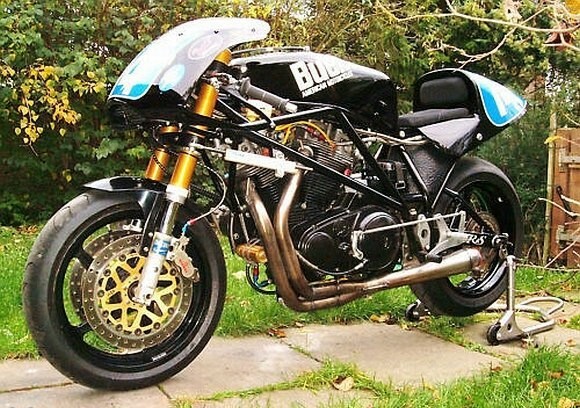 So Buell designed an XR1000-powered bike with racing in mind. It appeared in 1986 and was known as “Lucifer’s Hammer II”, or more formally, the RR1000. The RR1000 was a very small bike, with a wheelbase of only 136cm and a steering head angle of 25 degrees. It rolled on 16” magnesium wheels and Marzocchi M1R or WP upside-down forks, with the rear suspension placed under the engine. The engine is positioned high and forward, and mounted in the chassis using a ‘Uniplaner’ system designed to isolate the chassis from vibrations. The bike has a dry weight of 180kg, a 55° maximum angle of lean, and a maximum speed recorded at Daytona of about 280kph. The racer we’re looking at here was in boxes when Roberto Crepaldi of CR&S bought it directly from Erik Buell in 1992. After the parts arrived in Italy, CR&S spent two years restoring the bike and then put it up for auction at Bonhams in 2004. 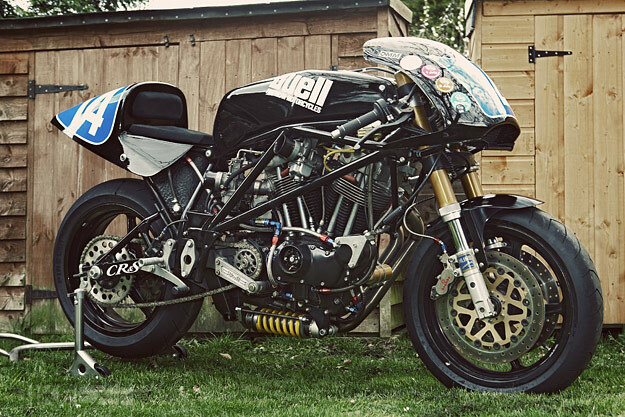 The man who owns it now is Englishman Steve Ledsham, who’s raced this RR1000R at Spa, Mallory Park and Brands Hatch: “I can say it goes, brakes and handles superbly,” he reports. Ledsham is currently undoing some of the CR&S mods and taking the RR1000 back to period race specification. “The forks, wheels, tanks and brakes were sourced in Italy and not Buell supplied,” he notes. XR1000-based engine with cutaway timing case giving access to the oil pump (high delivery type) and later primary cases which are better for racing (narrower). The crankcases have been strengthened in the usual places. The crankshaft has been reworked and now has race connecting rods from Carrillo. XR cylinder heads have been reworked with twin plugs, ported with bigger titanium valves angled at 60 degrees and operated by roller cam followers, pushrods and rocker arms. Gases are supplied by two 40mm Mikuni flat slide carburettors. The gases are carried away by a Buell “works” exhaust system. Each cylinder barrel has been lightened and a “Gilardoni” forged piston fitted (intended for a Ducati). The motor has a displacement of 997.10 cc. with 81mm bore X 96.80mm stroke, and four Storz camshafts with eccentric adjustment. Gearbox is standard but carefully assembled. A modified XR clutch and chain primary are fitted. The engine running on race fuel (115 octane) produces 94HP, with incredible delivery due to an almost flat torque curve. Buell RR1000 chassis none VIN and preproduction. The rear swing arm is of the type designed by Erik Buell for the Pirelli radial tyre in 1986. It’s approximately 50mm longer than the road RR1000 swing arm. Forks are very special 42 mm upside-down Ohlins: these are the rare early type used by many of the GP and WSB teams in the late 80s. Rear shock is Ohlins fully adjustable. The fairing was made of composite material especially for this RR1000. The fuel tank is handmade and alloy, produced by Giancarlo Berti. The engine oil tank was also made specifically and placed under the saddle, while the original version was positioned at the front under the engine. All linkages, fittings and brackets are handmade for this bike.